Mount Lewotobi Male is located side by side with Mount Lewotobi Female. 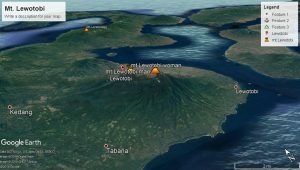 Both volcanoes directly border the sea in the east and south. The Morphology of Mount Lewotobi Male is pointed and steep. A crater is at its peak, and the wall is built by lava. The crater opens northeast. There is a small crater located north of this main crater, probably formed by phreatic eruption.